"Avalon is a part of the King Arthur legend and is a very romantic thing, when King Arthur dies the Queens ferry him off to Avalon, which a sort of enchanted island. It's the ultimate romantic fantasy piece." Rising to fame in the 1970s as the lead vocalist and principal songwriter of British glam art rock band Roxy Music, Bryan Ferry is an English singer and songwriter. Roxy music were one of the most prominent bands of the era, achieving three number one albums and ten Top Ten singles in the UK between 1972 and 1982, including "Virginia Plain", "Street Life", "Love is the Drug", "Dance Away", "Angel Eyes", "Over You", "Oh Yeah", "Jealous Guy", "Avalon" and "More Than This". contemporary of David Bowie, Ferry's iconic style influenced a generation both musically and sartorially. In 1973, while still a member of Roxy Music, Ferry embarked on a solo career, releasing several hits such as "A Hard Rain's a-Gonna Fall", "Let's Stick Together" and "This Is Tomorrow". In 1982, not long after the release of their best-selling album Avalon, Ferry disbanded Roxy Music, choosing to concentrate on his solo career. He continued to have successful hits like "Slave to Love" and "Don't Stop the Dance", and his 1985 album Boys and Girls was a UK number one. 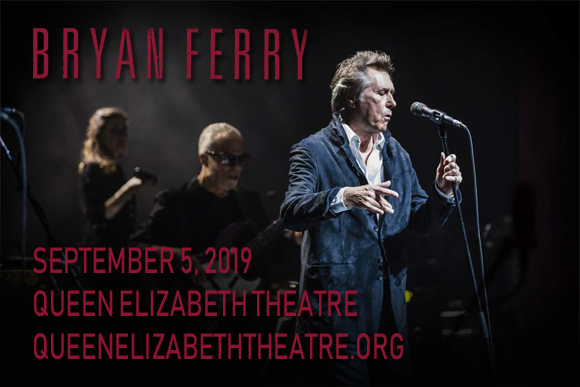 Ferry has sold over 30 million albums worldwide as a solo artist and member of Roxy Music. In 2019, he will be inducted into the Rock and Roll Hall of Fame as a member of Roxy Music. Ferry was made a CBE in the Queen's Birthday Honours for his contribution to the British music industry in 2011, and in 2012 he was awarded the French national honour of Officier de l’ordre des Arts et des Lettres.